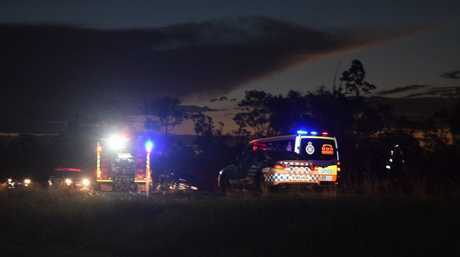 UPDATE: Police have charged a 49-year-old East Bundaberg man following a traffic crash on Goodwood Rd on Monday night. 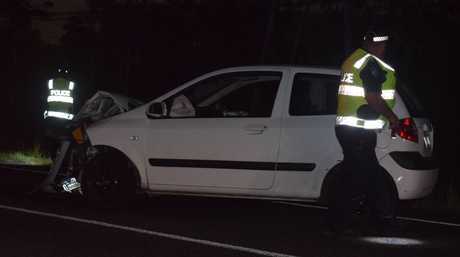 The crash happened around 6.45pm when a north-bound white sedan crossed onto the wrong side of the road and crashed into a silver sedan which ended up upside-down in a ravine on the 100km/h stretch of road. A Queensland Police spokeswoman said the man had been charged with drink driving offences and was issued with a notice to appear in court for dangerous operation of a motor vehicle and for being affected by an intoxicating substance. He will appear in court on March 23. It is not known if the large, black dog that jumped from the car following the crash has been found or not. 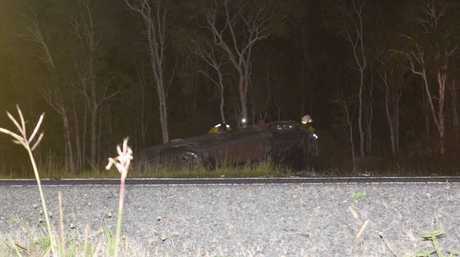 UPDATE: Bundaberg police believe alcohol may have played a part in a two-car crash on Goodwood Rd about 6.45pm tonight. Sergeant Tim Marrinan said it was lucky no one was seriously injured in the two-car crash, which happened about 16km outside Bundaberg. "At about a quarter to seven this evening, a north-bound white sedan has crashed into a south-bound silver sedan on Goodwood Rd. "It would appear that the white sedan travelling north was on the incorrect side of the road and crashed into the silver sedan. A car has gone down a ditch on Goodwood Rd. "The drivers of both vehicles have been taken to hospital, both with minor injuries, which is quite unbelievable from the crash that we've just witnessed. "The driver of the north-bound sedan is in custody and is undergoing further breath analysis once he's gone to hospital. "Police are still investigating the cause of why the white sedan was on the wrong side of the road." Sgt Marrinan said they were still looking for a large black dog that jumped out of the white sedan with Victorian number plates after the crash. The dog is believed to have run into the bushes. His message to drivers was to obey the road rules at all times. "Don't drink and drive, stay within the speed limit, drive with consideration for other road users, don't be distracted by mobile phones or other things in the car. "The fatal five, we keep going on about it all the time and unfortunately in this case the fatal five hasn't been adhered to by one particular driver." EMERGENCY services have rushed to the scene of a three-car crash along Goodwood Rd, about 16km outside Bundaberg. Initial reports suggest multiple people are involved, but all are out of the vehicles. 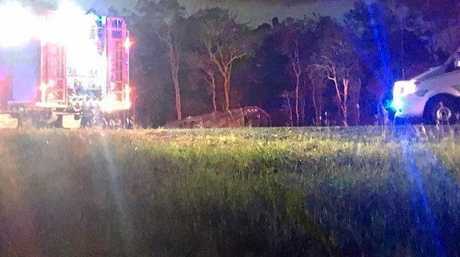 One car has gone down a ditch in the crash, which happened about 6.40pm. Fireys are working to upturn the car. Police are also looking for a dog travelling in one of the cars that fled after the crash. It is unknown yet whether anyone has to be taken to hospital as crews remain on the scene.